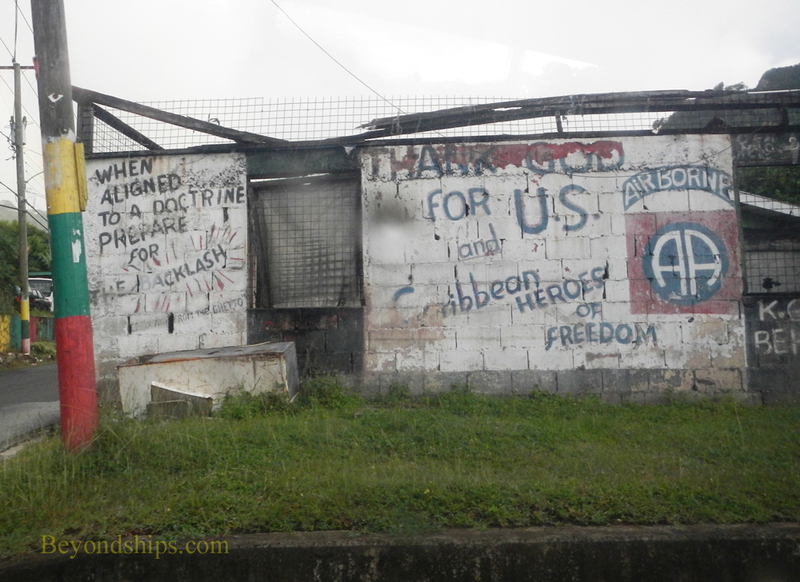 Above: Graffiti in St. George praises the 1983 U.S. led invasion of Grenada. Grenada drew worldwide attention in 1983 when the United States invaded the island. However, much more happened on Grenada before that event. As on most Caribbean islands, the original inhabitants of Grenada were the Arawaks. In the 14th century, the Caribs from South America eradicated the Arwaks. Christopher Columbus sailed by in 1498 and named the island “Concepcion.” However, his Spanish sailors were so reminded of Andalusia that they called it Granada. (Later, the French followed suit calling the island Le Grenade, which is French for Granada. The British corrupted this to Grenada). During the next century and a half the Caribs repulsed all attempts by the European powers to colonize Grenada. However, in 1650, a French expedition from Martinique persuaded the Caribs to sell part of the island to them. Relations between the Caribs and the French quickly deteriorated into war as the French attempted to expand their area of control to the whole island. By 1654, the Caribs were crushed but rather than surrender the remaining Caribs jumped off a precipice at Le Morne de Sauteurs. Grenada became a flourishing French colony. By 1753, it had 100 sugar mills with 12,000 enslaved Africans working on them. Shortly thereafter, the British captured Grenada without firing a shot during the Seven Years War. The island was formally ceded to Britain by the Treaty of Paris in 1763. But this did not stop the French from re-capturing Grenada in 1779 during the War of American Independence. However, they returned it to Britain in the treaty ending that war. Inspired by the ideas of the French Revolution, a mixed race plantation owner Julien Fedon led a revolt against the British in 1795. Approximately half of Grenada's 28,000 slaves joined with Fedon. The revolt was somewhat successful in that the revolutionaries gained control of most of the island except St. George. However, British forces put down the rebellion with great loss of life. Slavery was abolished in 1834. Britain introduced several new crops to Grenada including cacao and cotton. 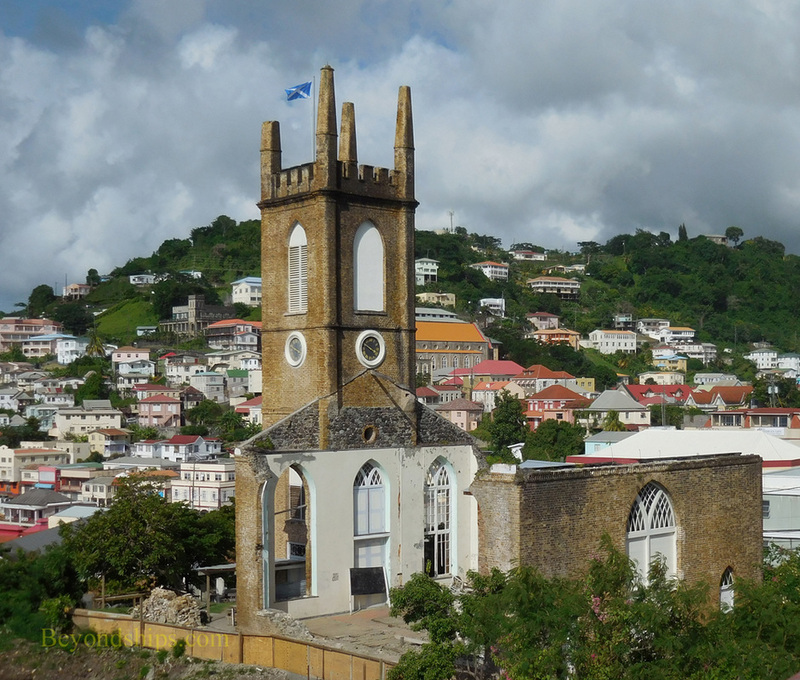 In 1843, a merchant ship sailing from the East Indies to England left some nutmeg trees on Grenada. The island is now one of the world's leading supplier of nutmeg. During the 20th century, Grenada slowly moved toward independence. Eric Matthew Gairy founded the first political party and it won the first election with universal suffrage in 1951. In 1967, Grenada became an “associated state” with full autonomy over its internal affairs. Then, in 1974, it became an independent state within the British Commonwealth. 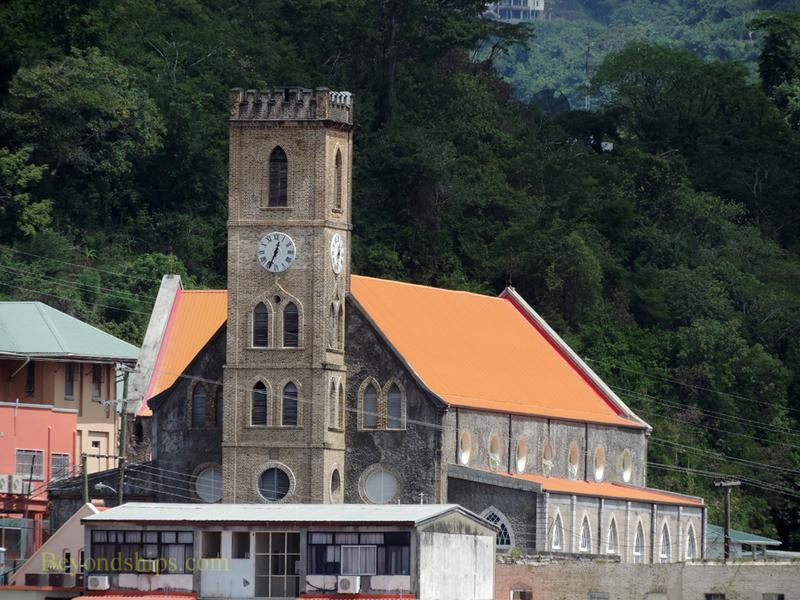 Above: The Roman Catholic Cathedral of the Imaculate Conception in St. George was built in 1818. A coup in 1979 replaced Grenada's parliamentary democracy with a leftist government. The new government, however, did not satisfy some of the revolutionaries who wanted closer ties with the Soviet Union and communist Cuba. This led to another coup in 1983 with a pro-communist military government. The former prime minister and seven others were executed. Meanwhile, Cuban soldiers and advisers had come to Grenada. One of the projects they were engaged in was building a new airport capable of handling large Soviet military aircraft. All of this, was making the United States and Grenada's neighbors quite nervous as it was feared that the Soviet Union would use Grenada to expand its reach in the Caribbean. In response to requests from Grenada's governor general and the Organization of Eastern Caribbean States, some 8,000 American and Caribbean troops invaded Grenada in October 1983. They successfully overcame the opposition, chiefly from Cuban forces, evacuated U.S. Citizens and restored the nation to parliamentary democracy. The date of the invasion is now a national holiday in Grenada.